Before I get down to it, I want to first and foremost call out my crew and pacers who really helped make my race turn out as best as it could. 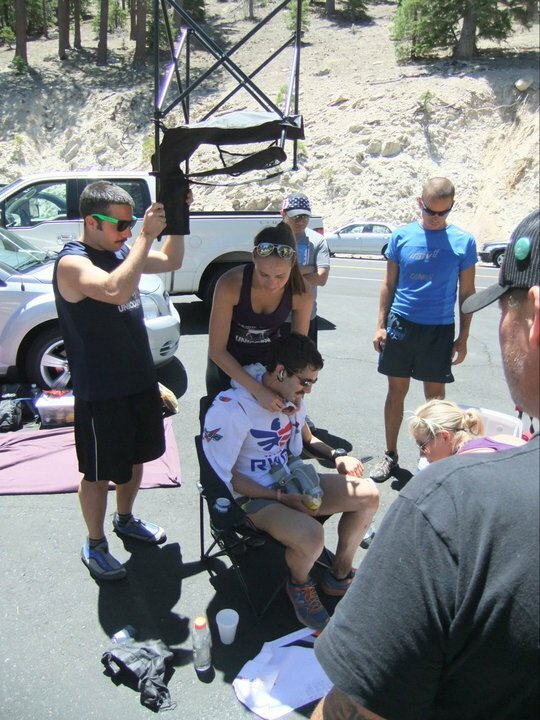 Natalie Kintz: My rookie crew chief got a little shell shock with my projectile vomiting at mile 13 (before the race I had promised her I was easy to crew;), but at every aid station after that she got right down to business getting calories in me and keeping me cool and comfortable. It was hard to imagine quitting when she was doing everything in her power to keep me going and pulling so hard for me, so I'm beyond thankful for her support. Ginna Hepp: No matter who you are, seeing your entire crew (including females) in mustaches at 4:30 AM with matching Team Dom-a-corn shirts is pretty funny. Ginna was super positive and kept me keeping my head up through the low points. Pacing me, she gave me a ton of emotional support praising me for all the good things I was doing well (and ignoring the bad stuff for the moment). Brian Fuerst: When I got the crew assembled, I didn't exactly have an idea of what I'd need him to do. That didn't matter thought because on race day he did a lot of awesome stuff to help out. He held a chair over my head for shade, stuffed ice bandanas and ran to grab random stuff when I suddenly needed it. He was a really humble guy, and I'm glad we had him all day; it wouldn’t have gone nearly as well without him. 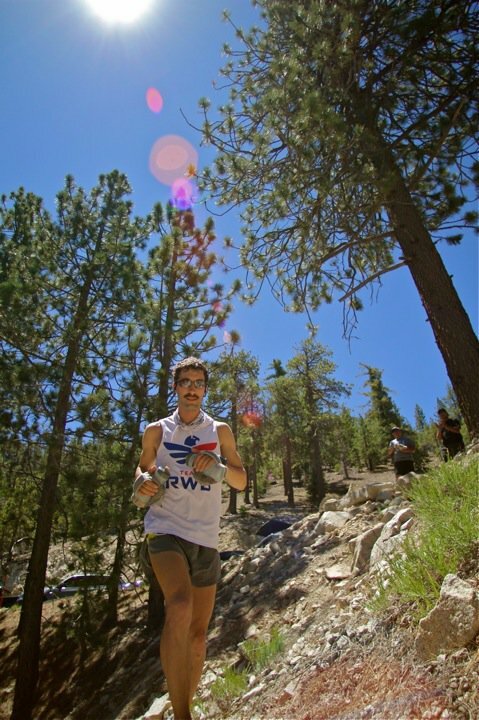 Ankur Tarneja: Out of my 3 pacers, he probably had the most fun with me as my legs and stomach really turned on for the last 25 miles. But, that also meant some sporadically fast climbing and downhilling (which he did on one water bottle and a bag of m&m's). He put up with my attempted burp soundtrack for 20 miles and kept me super focused on holding off 2nd place. We really had some special moments flying out of Idlehour and speeding through the dangerous singletrack into Millard. Those were some of the best miles of my life thus far, and I was glad I got to share them with him. Mari: Jorge's wife has been like a godmother (Madrina) all winter/spring/summer long. She has been so supportive of the hard work Jorge and I do, and inspiring in her own right as she ran more miles on most saturdays than me and Jorge did. She also helped me a bit on race day when I got sick at Vincent Gap, and was always cheering for me eventhough I was chasing her man all day. She truly is a great human in the sport. Katie: She put up with a lot of dead Dominic days in training, and followed me into the mountains more times than seemed logical. She had a tough race on Saturday, but never gave up despite a swollen knee (and those that know, know a knee is a need, not a want at the end of AC). She really gave me a lot of support when training for AC was really tough, and encouraged me all the way through it all. When I won, we won. Jorge: My Hero, el Chivo Loco was beyond a mentor, friend, and inspiration. The things that Jorge did for me were so incredibly selfless, that it's impossible to say that my victory at the race was a personal accomplishment. All year long Jorge pushed me, waited for me, talked strategy non stop with me, shared food with me, and cracked the lamest jokes with me. On race day we went out with the intention of pushing each other in hopes that one or the other would run close to the course record. One of us won, so in fact we both won. Nothing has changed, we're still committed to bringing out the best of each other in training, and we hope to turn some heads this winter at the North Face 50 Mile Championships. So watch out, the bay will get rocked. Katie and I headed up Thursday evening relieved the race was finally here. The night at Cloudburst was beautiful and I feasted on some pasta with Udo's Oil. Friday check-in was great to see lots of friends from out of town, and talk with tons of people about the race. I probably got a little too much sun, and ate a few too many pancakes and bowls of pasta, but I was nervous and just did what seemed right. In hindsight, I should've stuck to what I did in training never over eating and camping. The hotel in Hisperia was nice but I sat awake Friday night wishing I was in my tent. It seemed like forever for 5am to come, but finally it came and we were off up the road to the Acorn trail. Jorge took a 2 minute lead before we even got to the Acorn trail (he was definitely ready to run) and I and Rupuerto hung back and settled into a little more relaxed hiking-running. My legs felt great and I even took time on the climb to eat two gels and pee. I hit the PCT at 5:45 and made short and safe time on the approach to Inspiration Point arriving in 1:35. As much as I wanted to keep relaxed, I felt a huge rush of energy from the crowd as I crossed the road. 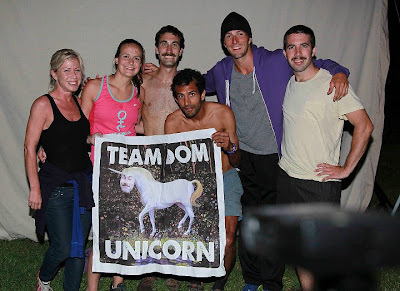 In a flash I went from the calm and serene PCT to some 50-100 screaming "GO DOM!". I didn't stop running and as soon as I was out of sight I actually started to cry a bit. It was such a contrast to the typical feeling of being alone in the San Gabes with Jorge. All year long we were running hard for ourselves in a completely silent environment that had no compassion for our selfish ultra running aspirations.. Yet on this day, a hundred plus people acknowledged our hard work and were right there pulling for us to GO! I haven't felt such an outpouring of love from so many people in my entire life, and it really choked me up. 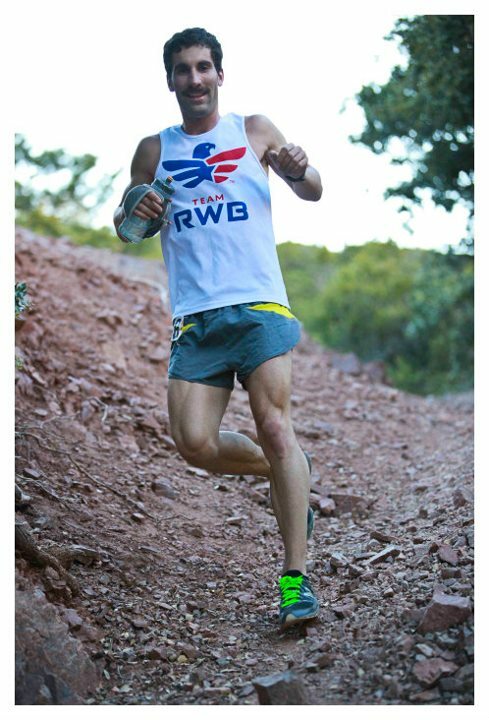 I wiped my tears and before I knew it the hyper-ventilating had gotten me pretty nauseous and I was puking my gels on the trail. Rupuerto caught up and talked me through it and was really calming. I thanked him and got back on pace taking the section in :40 (a bit slow, but good for the puking-crying delay). I thought my nausea would be gone now that I'd gotten over the excitement of race day, but I couldn't force myself to eat another calorie. I got to Vincent Gap and tried to gulp some gatorade down as I put my waist pack on. I asked for some cucumber and potatoes which always soothes my stomach, and as soon as I had a potato and a bite of cucumber it all came back out making a huge puddle of embarrassment in the Vincent Gap parking lot. I had honestly no clue why I was throwing up. I had trained all year for this moment in the race to summit Badden Powell with power and ease, and all of a sudden my stomach was completely shut off, and I needed calories and water back in my system. Two days before, Tony K had e-mailed me good luck and noted that he believed in luck because even the best preparations for a race could be wasted with bad luck. I thought he was mostly right, but still had a lingering thought that you could maybe think of everything, yet there I was with the worst of luck. In training I'd ran 90% of the climb, and on race day I got to run maybe 10% of it. I was incredibly frustrated and even tried stopping and letting my heartrate go down to see if my nausea would go away. Nothing helped. So I drank water and took a salt stick and hiked along taking small sips of gel until I got to the top some 25 minutes behind my plan and Jorge. I wasn't completely out of it though, and I smiled a bit and tried to focus on making up some time on the downhill. 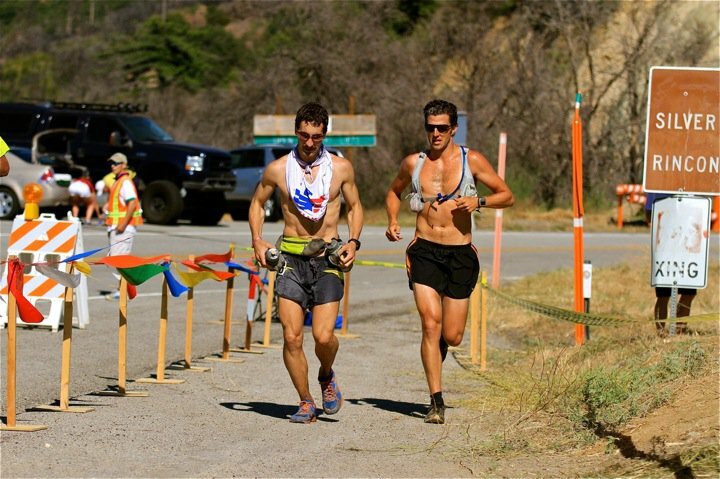 Rupuerto and I worked through the 8-9k ridge and once the downhill came I opened up my stride and focused on using gravity to get a little time back. Before I knew it, I was actually having a lot of fun whooping and yelling as I weaved around hikers on the way down to Islip. I nearly had to walk at every tiny climb, but my downhill technique was efficient enough from chasing Jorge all year, that I didn't lose any time on the downhill. Sure enough, I came into Islip just 25 minutes of my goal pace for the section (exactly what I'd dropped behind by on the uphill). Before I got to the scales I knew it wasn't going to be good. I had drunk all my water on that section, but I really needed more to replace what I had thrown up. I was almost 7 lbs under, and sat down to get some calories in me. My crew sprang into action and I was out of there in few minutes with another 250 calories in me and an ice bandana. As much as I hoped it would make a difference, I still was way under-fueled and the nausea still hadn't cleared. The calories sat on top of my stomach dripping in slowly one by one. Climbing Mt. Williamson in :34 was pretty depressing as it was another :10 off of what I had anticipated. The downhill was harder than before on Badden Powell as I was really bonking now and had to slow down to keep from falling off the side of the mountain. Almost an hour later I cleared the 4 miles to Eagles Roost and started changing things up: fruit snacks over gel, road RC 1400’s over MT101’s, and more fruit and soda. Down the road I crawled, burping a bit of the soda up and settling things down. Finally the road peaked and I pushed the 3 miles down to the Burkhardt Trail. I doused my head at the faucet in Buckhorn and again at the stream. The heat of the canyon was definitely turning up, but I had made my mind up not to blow up in it. I hiked the first steep ¼ of the climb, and jogged the traverse to the fire road. In training, I would have opened things up and pushed the pace all the way to Cloudburst Summit. However, on this unlucky day, I was patient with my stomach and the heat and crawled out with just enough energy to recover quickly at Cloudburst. The crowd watching at Cloudburst was probably just as impressed by my perseverance as by my crew working their butts off. I hadn’t looked good at all at any of the aid stations all morning, yet I was in second pushing along due in large part to Natalie & Co asking all the right questions and keeping all the right aid coming. I still was nauseous, but the gradual downhill to 3 points was the best part of the whole course so I forced myself to gut out a :48 run down there. I was super low on calories again at 3 Points and took a few minutes to compose myself for the hot traverse to Sulfur Springs and the climb up Mt. Hilyer. The heat wasn’t as bad as I was soaked pretty well and had a good ice bandana going, but I still was pretty tender. I jogged cautiously but found myself suddenly redlining on the climb to Mt. Hilyer. 7 Weeks before, we’d ran Vincent Gap to Chilao and I’d blown up going up that paved road. It was so simple, so gradual, so run-able, but it had burnt me so bad that I couldn’t even run down to Chilao. I promised myself I wouldn’t let this happen, and in the big picture, this was where the race changed for me and Jorge. I gave up 11 minutes there, but ran all the way down to Chilao, and got stronger all the way to Chantry. I talked with Jorge after the race and he said that Mt. Hilyer and Chilao were terrible for him, and it wiped him for the day. Had I been a little more aggressive there, I’m sure the story would have been much different. I came into Chilao ahead of website projections, and I started my surge (albeit very gradually). My crew was smoother than ever, and we were back on the trail in a matter of minutes. Ginna and I were confidently threading the needle through the varied terrain overgrown by Purple Poodle dog Bush to Shortcut. I ran up the paved road to Charlton flats, and surprised myself moving really well down to the base of Shortcut Saddle with Ginna encouraging me on every step of the way. 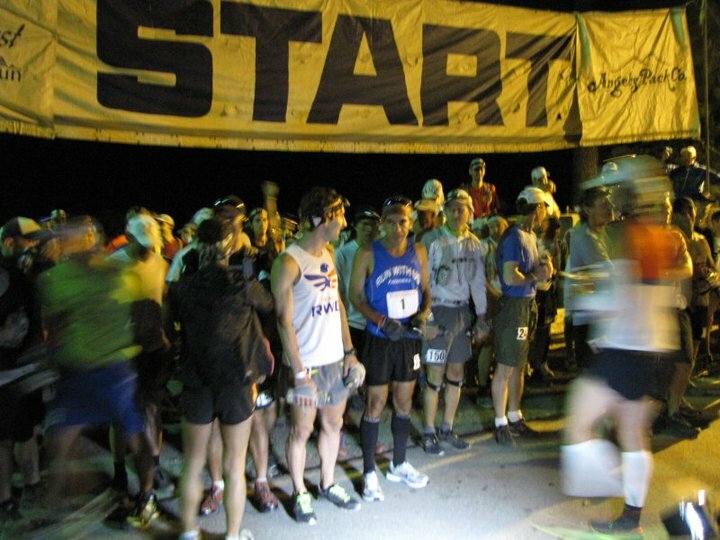 The tent at the Shortcut Saddle aid station was buzzing as I came in. 17 Minutes now separated Jorge and I. My crew was estimating my arrival based on the website’s estimations which was basing its predictions on my previous slower sections. However, now that I was consistently was 5-15 minutes ahead of the last few predictions, and Jorge was slowing down everything was refreshed with newfound vigor. As I came in and started calling out my requests, all 5 crew members were flying around getting me food and gear for the next section. 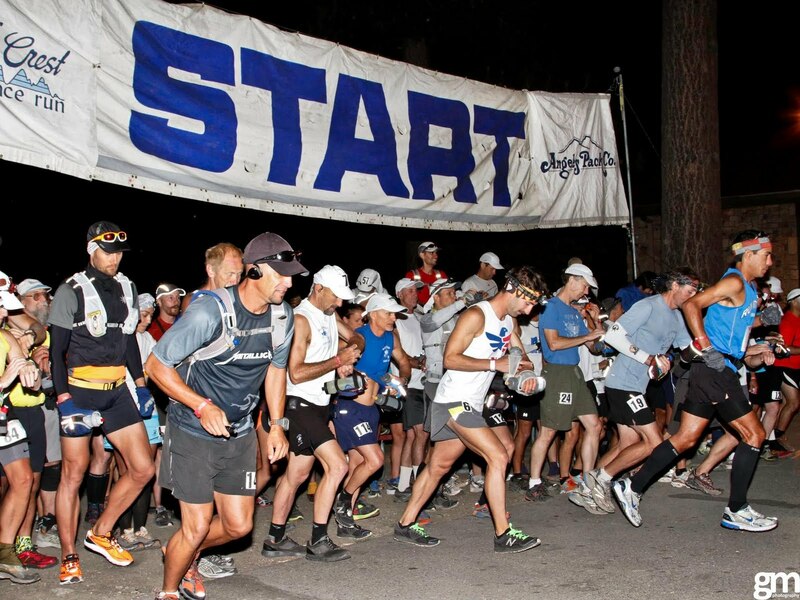 I could feel the energy of my crew and the aid station workers and it excited me to see them believing in me so much. As much as they were certain I’d catch Jorge soon, I knew the next 5.5 miles down to the river were very run-able and Jorge would run them hard. I also knew that as the sun went down, Jorge would have as good of a chance of salvaging his race as I would, so even if I was catching up, he could still just be out of reach for the remainder of the race. With all this in mind I tried to keep relaxed and focus on my race, but I couldn’t help but measure his footprints to figure out his stride or check over the switchbacks of the fireroad to see if I could see him below me. 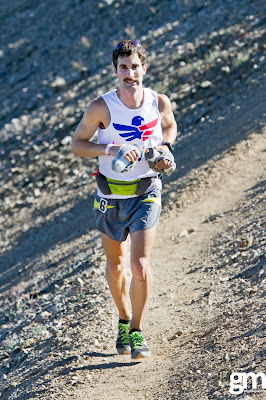 I couldn’t see him on any of the switchbacks and I could tell his stride was very long, but he had a significant duck footed angle to his footprint that meant he was getting tired. I imagined training with Jorge when he was tired, but still remembered how fast he could move when he was exhausted. Tyler talked to me a lot and helped me forget about the chase. He mentioned a plan to try and have a stage race in Southern California, which seemed a lot nicer than doing 100 miles all at once. When we got down to the river, I crossed it slowly dousing my head in the water trying to cool my body off for the long 2.5-mile climb. I knew it was run-able and that I could make up a lot of time on Jorge if my stomach relaxed. Yet, the road wasn’t run-able for my stomach. I kept trying to run, and I kept redlining and feeling sick. So we hiked the lower ¾ of the hill hard until I felt better and we ran in the last ¼ up and over onto the ridge that led into the aid station. I told Tyler to go a few yards ahead to grab my drop bag and some coke and soup. Just as we started to round the last corner to the aid station I noticed Tyler turn around and look at me with excited eyes. I looked just past him and saw the brilliant blue jersey of Jorge. I was amazed that we had caught him as I had been sure he had run harder than us. 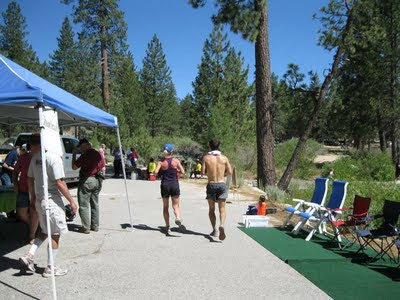 Yet, there he and his pacer were walking slowly into the aid station just as Tyler and I were running up looking fresh. We sat down together and I asked Jorge how things were going and he said that things were very bad. He couldn’t run up hill, and he felt like his race was over. I looked at the same man who had been invincible all winter, spring, and summer and was shocked at what the race had done to him. 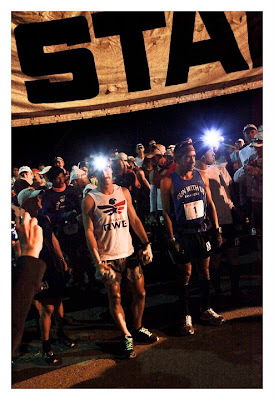 We had climbed the hardest parts of the course at the end of 150 miles weeks, and he had shown a super human ability to perform when he was so sore and tired. He always dismissed it as “well it’s just training, it doesn’t count, it’s not the same as the race,” and I finally understood what he meant. It wasn’t so much that the race was everything, it was that the race was abnormally more difficult than even the worst we did in training. Climbing 35,000ft in 150 miles in hard to do in 7 days, but climbing 21,000ft in 100 miles in less than 20 hours is really hard. 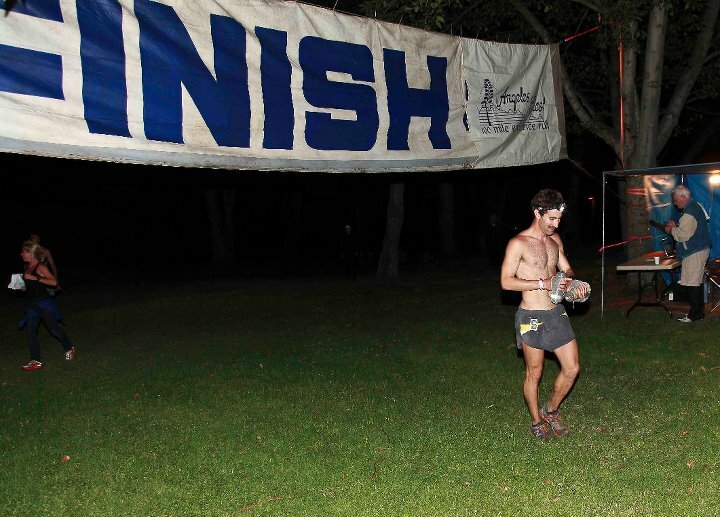 Once something breaks, the miles thereafter get exponentially harder until it gets fixed. Jorge had broken his stomach and it was worse than even a 250 mile training week. I told him that I wished the best for him and he told me I didn’t have to worry as he wasn’t going to chase me. 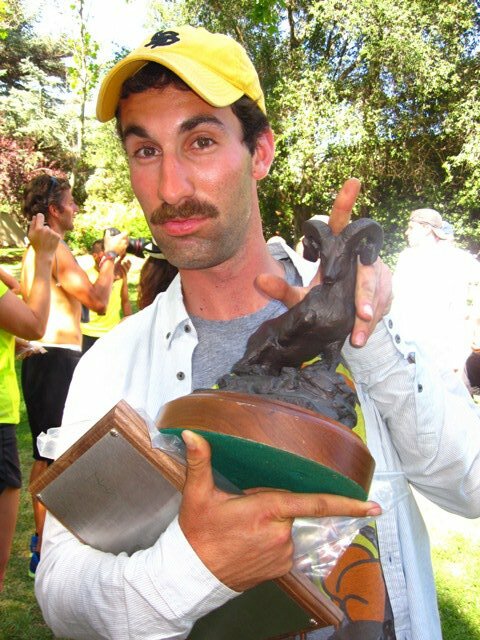 I looked at him once more and told him I was still going to run in hard for myself and he wished me luck one last time before I headed down the traverse to start the descent into Big Santa Anita Canyon. After a few silent moments, Tyler exclaimed “YOU’RE GOING TO WIN AC MAN!” I looked over at him and smiled big, but quickly began explaining all the bad things that still could happen in the next 32 miles, what I still had to climb, and what I had to avoid doing. But, when he said it out loud, it really started to become a reality. I had slowly fought my way back from what was a nightmare race I wanted to drop from at mile 30, and was now on the way to victory. We pushed the last .7mi hill up into Chantry where crews were waiting. I saw Mari first and gave her a big hug telling her how sorry I was for Jorge and to take good care of him. She wished me luck and my crew sprang into action again for the last time. Socks replaced, soup in my stomach, water bottles, gel flasks, and pack refilled. The 9 minute stop was a little long, but when I left I was completely ready to attack the last 25. I needed that because second place (Rupuerto) turned out to be only 37 minutes behind at that point. Last year, I had lost nearly 2 hours to him over the last 25 when I had a sprained ankle. This year though, I had my stomach and my legs under me with my competitive and tactical pacer Ankur Tarneja. We jogged all the way over to the turn off for Winter Creek and I began a ravenous hike-run up the 2700ft, 2.5 mile climb. Each and every step was energized and excited. We had heard a cheer when we were 15 minutes outside of Chantry, and thought I only had maybe 20 minutes on the next runner. 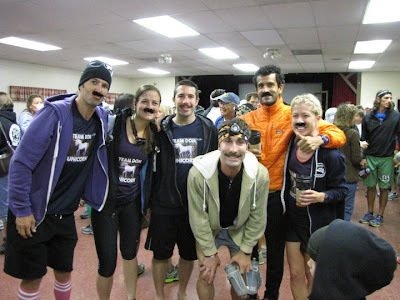 It turned out to be a joke cheer for a pacer coming in alone, but we weren’t going to take any chances. It felt like a full on race, and it was as far as we were concerned. Though I didn’t know this until after the race, by the time we reached Idlehour at 83, my lead had grown from :37 to a full hour. We checked in and my status on the website changing confused the timing personnel at the aid station who couldn’t compare my Chantry time to Rupuerto’s Chantry entry time anymore. I told them we had been on the trail for a little over two hours and they hastily estimated that he left Chantry 15 minutes behind me. I knew my past split was good, but I also knew a good runner could have easily run 15 minutes faster. I told Ankur this and we rushed leaving half finished cups of soup and coke. The trail down into Idlehour was a bit technical, but a complete adrenaline rush at the speed we ran it. 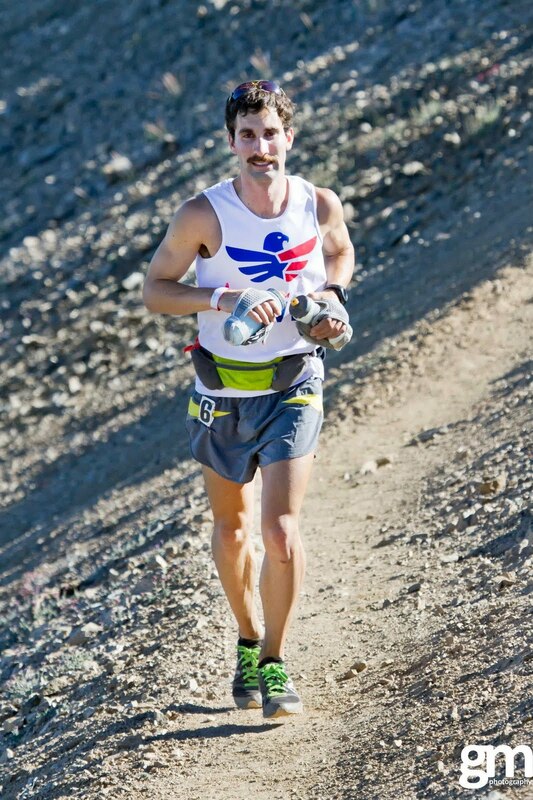 As far as I knew at that moment this canyon was my defining moment of my race. There were no more climbs that Rupuerto could catch me on, just downhills. I had one chance to push the climb and reach the next aid station at Sam Merrill with a cushion on second place. So we dropped faster and faster until it bottomed out near the poison oak infested campground of Idlehour Canyon. The traverse through was even more technical and we pushed hard to keep my momentum going. A couple of trips and falls later we were starting the gradual climb up the first wall. It was incredibly surreal to remember my hopelessness last year and to see my legs not just hiking fast, but RUNNING up the switchbacks out of the first canyon. Ankur was psyched and cheered me on, but kept reminding me to go to my gels every 15 minutes. We flew down another dangerous descent into the second canyon and started the second climb at :48 minutes in. Those that know Idlehour know this is really fast to get there at this point, and I excitedly told Ankur “this is really good man!” Still, another long 1,200 feet awaited and I cautiously ran-hiked pushing up onto the final lip to see the approach lights (set up similar to an airport runway) pulling us in at :68. I estimated another ten minutes to Ankur and sure enough we pulled through in :78 nearly a full 6 minutes under the record pace (2 minutes under for the total section). The aid station was sleepy but happy to see me, and told me I was now about an 1:15 ahead by their estimates. I dropped my waist pack and shirt as we refueled and pushed out for the last 11 miles down to the city. Before I made it 20 yards down the trail, I threw up. Excitement and too much soup and watermelon had my stomach turning inside out again. I’m pretty sure the aid station heard me retching, but Ankur just kept telling me to relax and we walked off the excitement for a good 200 yards. Finally I felt better and I ran down the (more technical than ever) trail to Echo Mountain. After a few near death slips, we began the traverse across and I ran hard over the more consistent trail. The top part of the Sunrise trail to Millard was in good shape, and we flew through the darkness with me leading through the 1,000 plus cobwebs. The middle part of the sunrise trail was overgrown and technical and we slowed down enough to realize that the sub 20 hour time was now out of reach. Still we pushed ahead and finally hit the last .7 miles to Millard which was in great shape and a blast as we hit 6:30 miles flying through the trees with just enough control to stay on the trail. At Millard they had lost my drop bag of some non-caffeinated gels and all I had left on me was 3 caffeinated gels. I was already feeling the effects of a flood of adrenaline over the last few parts so I tried to eat some fruit and potatoes to eat some other non caffeinated calories. We left with 4.7 miles to cover in 30 minutes and knew the sub-20 was out of reach. Still, we tried to push as safely as we could through the El Prieto trail, but it gave Ankur a bit of trouble. Running behind me and trying to pick out the rocks through my dust and the beam of his headlamp was hard work after 23 long miles. Eventually we popped out around 1:09 AM and enjoyed the last few thousand yards to JPL. 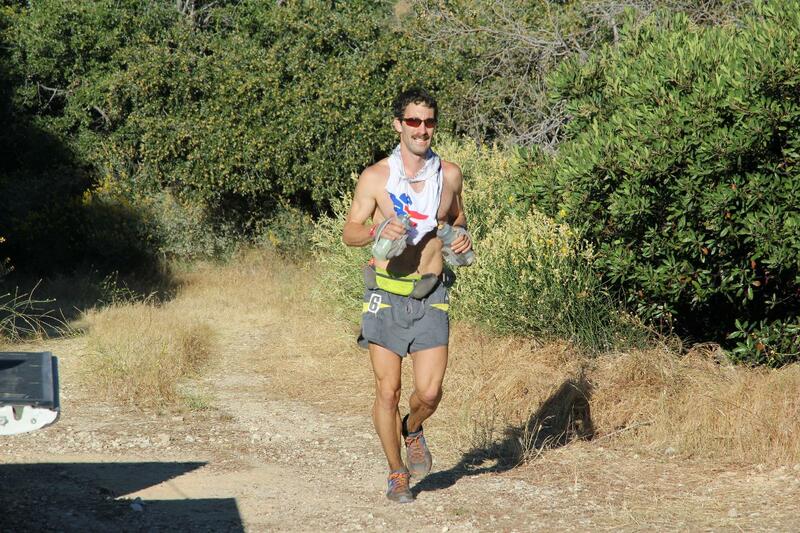 I could finally admit that I really was going to win the Angeles Crest 100 and I couldn’t stop smiling. I caw-ed as loud as I could at my crew waiting at the end of Altadena Dr. and they cawed excitedly right back. All 5 of us ran the last ¾ mile in and I crossed the finish line at 1:21 AM, some 20 hours and 21 minutes from the fateful start in Wrightwood. I thanked everyone for their help all day, snapped a few pictures with Mr. Trail Saftey Larry Gassan, and talked the race over with Monica and the rest of the crew for a half hour. Natalie drove me over to Adam’s, I got a shower that must’ve taken a pound of dirt off me, and we headed back to the finish. We stopped by McDonalds which was surprisingly packed at 2:30 AM. After a McChicken and McDouble, I felt like I was in heaven before I knocked out for 30 minutes before cheering on every finisher from 3rd place Tommy Nielsen to anchor runner Cheri Rich 9 hours later. I don’t think I’ll fully understand the event for another week, but right now I can say that I’m really grateful for all the support throughout the race. 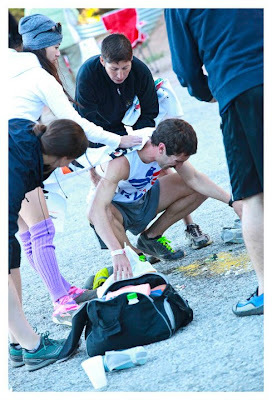 I went into my training telling myself that “I had to be strong,” but by the end of the race I was saying “I love everyone!” Really when it came down to it, my time wasn’t fast, my race wasn’t anywhere near perfect, and my pacing early on was dumb, but the reaction to the early shock of throwing up was very positive because of my crew, and it turned out to be good enough to gut out a win on a tough day. I think this year was tougher because the hot days of training at altitude that allow the body to acclimate never really came. 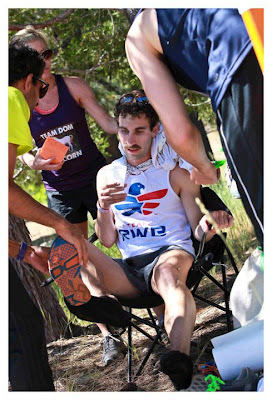 Race day was one of the first of a handful of hot weekends of the year and everyone had to re-learn heat and altitude occurring concurrently. Had the race been in mid-August, things might have actually been easier. At any rate, I learned a ton, and am excited to go on to other races this year with this experience and confidence. On schedule right now is Bulldog 50k in a month, and after that either Pine to Palm 100 or Bear 100 if I feel up to it. Recovery has been good this week, but I still am knocked a little ways back from racing for now. Sweet read man. Can't wait to see the rest...congrats again! What you did was good ole' blue collar hard work.Period .Congratulation,well deserved.For us guys from the back of the pack, that was a no joke race. Im hummbled. You did a great job, Dominic. 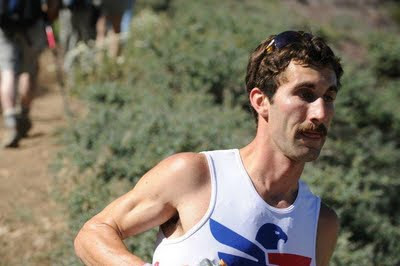 And several people have shared with me how much class you showed during the race and also humility after the victory. Congratulations. You deserve it. Well done running and writing. Your knowledge of the course, splits and strategy are in the company of a few dedicated runners Thanks for capturing the journey. Rest up and hammer on. Solid run homeboy. Hope to run/camp/kick it with you soon. I doubt I'll be around for bulldog, but if my plans change I'd love to give you a run for your $... Or at least try. Congrats on an awesome performance. Great report. Wow - tough day old bean. Love the grit you showed in pushing through. Keep the fire burning! What a journey, what a race! Inspiring effort and great recap, I felt like I was watching your race unfold. Thanks and congratulations again! Awesome job again. It's unbelievably motivating to read through your suffering, recovery, and joy. You trained hard, did LOTS of homework, and it all payed off. I can't wait to see this course for myself!